Hi. I have 1P6 for Mac. I downloaded 7 for mac to check it out. I want to revert back to 6. How? I see I have two applications in my Apps folder now. One is apparently my standalone 6 and the other is the new 7. But it's the new 7 that comes up in my mini....and its not fully functional unless I upgrade or subscribe. How do I revert back to 6 and delete the 7 and revert my mini to my 6 fully functional version? Referrer: forum-search:I downloaded 7 for mac and don't like it and want to revert to 6. How do I do that? Launch 1Password 7 then press control + option + command + Q fully to quit it. Drag the 1Password 7 application to the trash. Double click on the 1Password 6.zip file in your Applications folder—and you should find you are up and running again with 1Password 6. Perfect! Worked fine with your instructions. They definitely should hire you for customer support....and to lead it frankly. Their support takes days and they mainly refer me to 1P website references.....that I had trouble understanding in the first place! Also no phone support at all which makes me very nervous. Now that I am back to version 6 and full function, what is your opinion of 7 for Mac? Is it worth it to upgrade? Standalone or Account/subscription? I didn't really like the look and smaller fonts in 7 and I could see little difference in functionality. But maybe there are new features and new security improvements under the hood that I really should upgrade. I am using the standalone version 6 on an IMac, 2 IPhones and an IPad. Also what is your opinion of the account/subscription. I have some concern about my passwords residing on Amazon's servers from a security standpoint....even if 1P administers it. But their website says its safe due to encryption. Thanks again Stephen C. You are the greatest! @jcminnesota thanks for the kind words. Please do understand I am a mere mortal user here and, in particular, I have virtually no experience of AgileBits' subscription offering through 1Password.com. To that extent what follows is biased. However, I've given my personal responses to your questions for what they're worth. I think 1Password 7 will be a worthwhile upgrade once some of the bugs have been squashed, once there is a much fuller section devoted to it in the knowledge base and once the new 1Password mini has been further developed to take account of various comments made on this forum. I believe it was released in too much of a rush (and just before all the developers went to Apple's WWDC—which resulted in a dearth of support on this forum just after the release, which was very bad timing). If you want a summary of the new features this AgileBits' blog post is probably the best thing to read. I am a devoted standalone licence user and fervently opposed to subscription software so do bear that in mind. That said, AgileBits will tell you that its subscription offering with solve all your synchronisation woes between devices (probably true), is secure (which also seems true to date) and is the best thing since sliced bread. However, all is not sweetness and light. There have been comments on this forum about that way in which the sync service deals with attached documents (it keeps them separately from the main item, unlike the standalone version, but links to them—and, on occasion, those links can be lost). There are also some small odds and ends which I believe the subscription service does not support but which the standalone app does. They're not hugely significant and I can't recall exactly what they are at present. My personal objection to subscription software is that every company tells you how cheap it is, and what good value it is—but when you end up with five or more subscriptions it's not cheap at all. Further, the family subscription is fine if you have a "family" of four members but certainly not such good value if your "family" consists of only two. I have laid bare my prejudices for you. I'm sure there will be a chorus of those who offer the (perfectly fair) alternative views. Not an AB employee, but you should be able to just 1) quit 1Password; 2) drag the 1P7 and 1P6 apps to the trash; 3) empty the trash; 4) re-install 1P 6 (link here for download unless you bought it from the Mac store, then just re-download from there). Stephan - your instructions worked almost perfectly. Got version 6 back on my Mac, but still have version 7 and 6 ZIP in my App folder. Is that a problem? Can you suggest a method to delete them? An outline of the new 1Password 7 features can be found here or on the official blog post that Stephen linked above. We highly encourage users to upgrade to 1Password 7 as 1Password 6 is no longer in development. Also, we apologize for any recent support delays that you may have experienced. Ever since the 1Password 7 release for Mac and Windows, our support teams have been backlogged and have been trying their hardest to get through the requests. Finally, we take customer feedback very seriously. If you are unsatisfied with the upgrade to 1Password 7, please let us know why so we can make the experience perfect for you . Quit 1Password by holding down the option, clicking the 1Password icon in the menubar, and choosing Quit 1Password. Trash all copies of 1Password in your Applications folder. Open the Mac App Store app and click on the Purchased tab. Look for 1Password in the list and download it again. Quit 1Password 7 completely by typing ^⌥⌘Q (or just holding down the Control and Option keys as you choose Quit from the 1Password menu). Delete 1Password 7 – don’t use any app cleaners or uninstallers to do this, as these programs can remove more data than we want them to. Just drag the 1Password 7 app from your Applications folder to the Trash, then empty the Trash. Visit our updates server and download the most-recent version of 1Password 6 for Mac and run the installer. Open 1Password and you should see the lock screen. The Master Password you were using for 1Password 6 for Mac should unlock your data. (Potential) extra step for Dropbox users. 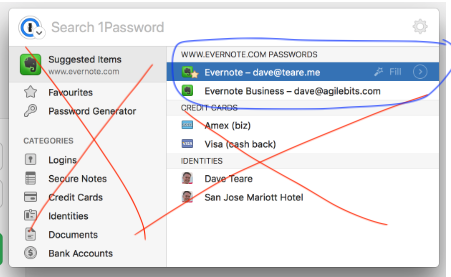 If your sync method in 1Password 6 for Mac was Dropbox using an Agile Keychain, you will need to reset sync, as 1Password 7 will have converted these older Agile Keychains to the newer OPVault format. Open Preferences > Sync and - for each vault - choose Dropbox as your sync method again, and select the appropriate OPVault. Thanks JadChaar. Its good to hear you (and hopefully Dave T) are aware of my (and others) concern about the responsiveness of your support folks. I understand that rolling out a new version will create a major increase in support requests....that should decline over time. Hopefully you all are addressing this "workload spike" to meet user needs. Part of my frustration with making a decision on the switch from V6 to V7 is the delay in support response.....and also that I get canned references back to existing webpages (that I did not understand in the first place and needed additional information). And I will repeat again, the need to have some level of telephone support available, even if through an added subscription. Not all people learn by reading instruction manuals.....and frankly some can't fully understand them. Migration to me is something birds do! As for the switch to V7 I expect I will get enough information eventually to make the switch. It is helpful and reassuring to me that you do recognize there is some concern about support and I expect you are working to improve the responsiveness. Time will Tell. By the way I do love 1P! @Stephen_C Thanks for your feedback--when I wrote my comment, nobody in here had responded yet; looks like they approved it only after yours made it in. I certainly didn't mean to contradict your advice! Just curious, what is about the way I suggested that is problematic for reverting to 1P6? I don't want to pass around malicious advice, so I appreciate your input. It seems like the official advice from @jadchaar was quite similar to mine, so any clarification would be great. I typically recommend grabbing a fresh copy of 1Password 6 from the update server rather than unzipping the zip so that the latest version of v6 will be installed, even if it was not before. This also makes the instructions more long standing as if we do ever have to release an update for v6 we’ll certainly want folks getting that update rather than unzipping an older version. Nothing wrong with either method. how can i reinstall 1Password 6 for my wife's iPhone 6 + ... ? You can’t install 1Password 6 on iOS anymore. That said, 1Password 7 is a free upgrade there, and if you’ve been keeping up with updates that is likely the version you have been running (I’d also suggest double checking your phone... it is probably actually running v7 unless you’ve intentionally been ignoring updates). A warm smile to you as well @chasan ! Thank you for being a loyal customer. Please let us know if you have any other questions. is it possible to run both at the same time on the same computer to keep a visual of 6 ,,,while making any personal adjustments in 7 ? and run 7 on an other one ? @chasan: I wouldn't recommend trying to use multiple versions of 1Password on the same computer to anyone. I sort of have to sometimes, and the OS does not make this easy. It's really best to use the one you prefer. That makes things much less stressful. @Brenty: thankyuuu for your reply that it is best not to run both at the same time on the same computer. and run 7 on an other one while syncing to the same Dropbox file? Glad that you have a setup that works for you. Have a great weekend! One of the great things I like about 1PW6 is the small window and it brings up the suggestions for the site I am on. There's just too much on the 1PW7 window. I would love to upgrade to 1PW7 for all of the other reasons. Would it be possible to have the option on 1PW7 to display the smaller window as in 1PW6? That would be perfect! Thanks @ginnySL. I’m not aware of any plans to bring back the 1Password 6 layout here. Could you elaborate on why the larger window is a problem for you? Does it cause some difficulty? It covers so much more of my screen plus I like the way with 1PW6 shows only the site I'm on and none of the other extraneous information. It's easier to just get to my work. Thanks for clarifying. We don't have plans to remove access to all of the categories from 1Password mini (those were also present in 1Password 6) since I don't think we've gotten other requests to do that, but we'll continue to evaluate your feedback along with everyone else's as we develop future versions. I cannot login to any site on 1password6 now. The login and password are there but will not populate the password field when I try to login from 1password6 now. How can I get the passwords to fill-in on websites again like they always did? @artvandaley - I'm sorry for the trouble! The first thing I'd do is restart your Mac, and see if that makes any difference. Let us know.